Jagram Arondine Gazebo: The Jagram Arondine Gazebo is a unique circular wooden gazebo with a choice of felt tiles, cedar shingles, or aspen chip. This light and airy garden structure has a range of options to personalize the gazebo to your preferences and requirements. Felt shingle bitumen roof tiles can come in black, green, or red. Handcrafted red cedar shingles are a very attractive alternative to felt shingles, or for a rustic look aspen chip gives the gazebo an eco-appearance. A pressure treated wooden floor is available to increase the functionality and comfort of the gazebo. Benches are available to fit the interior of the circular gazebo, and can be sold with specially made soft bench cushions to create a really comfortable space in your garden for reading or relaxing. A round wooden table is also available to fully complement the range of options available and make the gazebo a versatile and practical addition to your outdoor area. 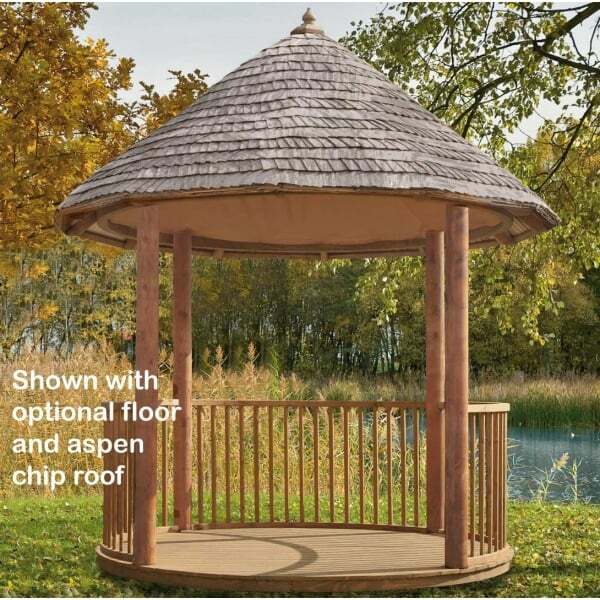 All wooden elements are responsibly sourced from properly managed Northern European Softwood forests, and are pressure impregnated with an advanced formula wood preservative that guarantees the gazebo for ten years against decay, weathering, and insect attack. Baluster walls and handrail top are included with the gazebo. All required fixings and instructions are included, and full professional assembly is included in the purchase price (excludes Scotland).